Tuberculosis, once thought to be a disease virtually eliminated in the first world has become a major health concern. Health care workers, the immunosuppressed, and HIV-positive people are particularly at risk. The rising rate of infection with M. tuberculosis along with the increase in antibiotic-resistant strains has made the development of new antibiotics for the treatment of tuberculosis of major importance for public health. 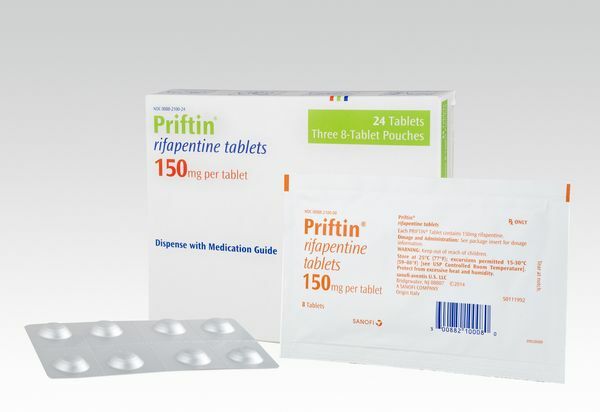 Rifapentine (Priften, Hoechst Marion Roussel), a member of the rifamycin class of antibiotics, was approved in June, 1998 for the treatment of pulmonary tuberculosis. Rifapentine (Priften) eliminates both intracellular and extracellular Mycobacterium tuberculosis organisms by preventing gene expression. The function of DNA-dependent RNA polymerase is inhibited in M. tuberculosis but not in mammalian cells. Both rifapentine and its active metabolite, 25-desacetyl rifapentine, are localized to monocyte-derived macrophages. Treatment with rifapentine (Priften) is broken down into two phases: an Intensive Phase, and a Continuation Phase. In the Intensive Phase of treatment, rifapentine is administered at 72 hour intervals for two months. It must be administered along with at least one other antibiotic accepted for the treatment of tuberculosis. Streptomycin or ethambutol may also be required until the results of susceptibility testing for the specific M. tuberculosis isolate are known. Following the Intensive Phase of treatment, the dose of rifapentine is reduced to one dose per week and should continue to be administered along with an appropriate antibiotic. Susceptibility testing should be conducted at regular intervals during therapy. Patients should be educated as to the importance of compliance during the entire course of therapy, since lack of compliance has been associated with a high incidence of relapse and delayed sputum conversion. M. tuberculosis strains that are resistant to members of the rifamycin class of antibiotics are likely to be resistant to rifapentine as well. Strains that are resistant to isoniazid or streptomycin are less likely to be resistant to rifapentine. The emergence of rifampin mono-resistant strains of M. tuberculosis has been identified in patients with HIV who were being treated with rifapentine (Priften). More frequent dosing with rifapentine is recommended for the treament of HIV-positive patients. In addition, coadministration of rifapentine with indinavir substantially decreased pharmacokinetic parameters for indinavir, therefore, rifapentine is not recommended for patients taking protease inhibitors. Rifapentine (Priften) may cause serious hepatic damage. It should be administered to patients with liver test function abnormalities only in cases where the advantages of treatment outweigh the disadvantage of delay. It is essential that the patient not miss any doses of rifapentine during the intensive phase of treatment. Missing a single dose can decrease the effectiveness of the drug and encourage the growth of resistant bacteria. The patient must complete the full course of therapy. Rifapentine (Priften) may produce a red-orange discoloration of skin, teeth, tongue, urine, sweat, sputum and tears. This may result in permanent staining of contact lenses. In addition, the effectiveness of oral contraceptives in women may be decreased while taking rifapentine. Women relying on oral contraceptives should consider switching to other forms of birth control while taking rifapentine. 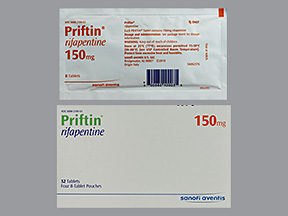 Patients who experience nausea or vomiting after administration of rifapentine should try taking rifapentine with food.